Thistle can be a real pain, literally. Featured in many pictures with small birds feeding on their colorful blooms, thistles are invasive weeds that can rob the surrounding soil of nutrients and damage lawns and pasture land. Thistle weed produces sharp spines, from which the plant takes its name, that can cause discomfort to the unlucky individual grasping one. 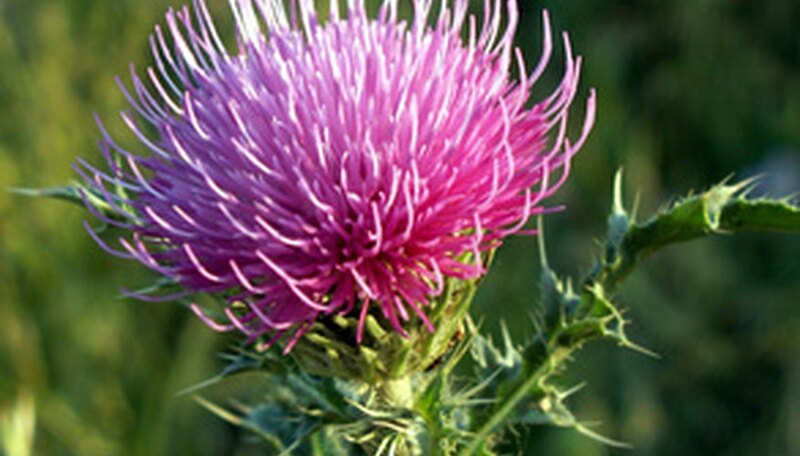 Several varieties of thistle exist throughout the U.S., including the milk, bull and Canadian thistles. Chemical herbicide treatment is one popular method of controlling this aggressive weed. Purchase a weed-killing herbicide with the ingredients 2-4-D and Dicamba from a garden center, home store or big box store. Familiarize yourself with the product by thoroughly reading the manufacturer's information and cautionary statements on the label. Place an herbicide spray tank on a level surface. Unscrew the top and set it to the side. Consider placing several paper towels under the sprayer to collect any spills that may occur. Determine the size of your spray tank. Typically, spray tanks for homeowner use range from 1 to 3 gallons. Pour enough liquid herbicide into a measuring cup to mix the desired number of gallons. Pour the herbicide into the tank. Add water to the tank slowly to reduce the amount of foam caused by mixing. Fill the tank with water to the desired level and screw the lid onto the tank. Pressurize the tank by pumping the handle up and down. Apply the 2-4-D and Dicamba herbicide to the entire surface of the thistle. Treating the thistle in the spring or fall is an ideal time, as this is when the plant is in the rosette, or seed producing, stage. Follow up with a treatment several days later to make sure the entire plant has been eradicated and not only the top. Wear a long-sleeved shirt, safety glasses and gloves to help reduce the possibility of contact with the herbicide. Follow all manufacturer's directions and cautions closely.